Dahi vada was always my favorite Indian dish when I first lived in India in the 90s. I would have it for breakfast and snack. That’s why I was really excited to learn that it is allowed on the GAPS diet! Vada refers to the sponge-like and bread-like deep-fried lentil balls. You can find the lentils at your local Indian food store. Dahi refers to the curd with which the vadas are eaten. This dish is traditionally eaten with tamarind chutney, which you can make sweetened with dates and/or honey instead of sugar. Chat masala is a delicious mix of Indian spices which you can buy ready-made at the Indian food store. Chat masala is sprinkled over the dahi vada, producing a sweet and savory dish. My friend, Satyapriya Pillai, taught me how to make this dish. Prep ahead: Rinse and soak 1 cup white whole urad lentils in warm filtered water with two inches to spare and 1 T whey, lemon juice or apple cider vinegar for 10-12 hours. *chat masala is a spice mix that contains hing, which is mixed with wheat flour when sold. Skip the chat masala if gluten-free. Strain most excess water from the lentils. Blend lentils and salt in blender or food processor, adding just enough water to assist the machine to blend the lentils into a paste. Transfer pasty batter to a bowl. Heat up about 3 cups pure water in a pot and set near the pot where you will be frying the vadas. Heat on medium to medium-high one inch of coconut oil in a small pot. Alternatively, you can heat up a shallow pan with little oil if you make them in the shape of little pancakes. The oil should not be so hot that it smokes. Add a small drop of the batter to the oil. The oil is hot enough if the paste sizzles. To make them in the shape of balls, wet your hand in a bowl of water to prevent it from sticking to the paste. Pick up 2 T of paste in your hand and drop into the oil. Alternatively, you can try dipping a spoon in water and using the spoon to handle the paste. Flip the vadas over to get light brown and crispy on both sides. If the vadas stick to the pot, the oil is too hot. When done, transfer vadas to pot of hot water. This fluffs up and softens the vadas to later add the yogurt. This step is optional but I like my vadas soft. The vadas can soak in the water for 10 minutes or longer. Remove vadas from water and place on towel. 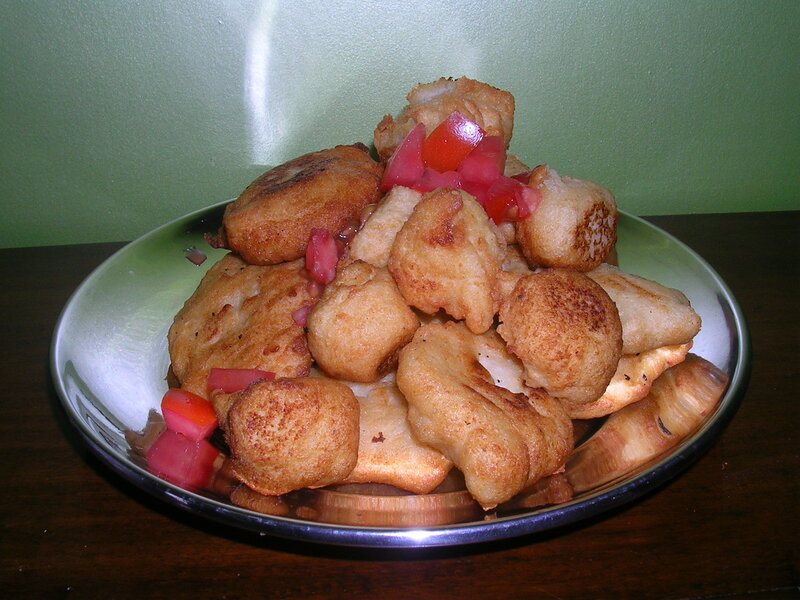 Top about four vadas with yogurt or kefir. Add the sweet chutney and sprinkle with chat masala. The vadas taste best on the same day, but you can also eat them the next day too. As long as you’re going to the Indian food store and are heating up the coconut oil, I recommend also making papaRdum, which are like large chips made of urad lentils, the same type of lentils which make up vadas. These are really easy to make. They come in a package and you only deep fry them for one second! Check out this post for making papaRdum. *omit the yogurt or kefir for Blood Sugar Control Diet and Whole30.